Receipt Signed by G.H. Griswold for Taxes Paid for by Orange Johnson for Nathaniel Root's Town Lots from the collections of the Worthington Historical Society (WHS) may be used for educational purposes as long as it is not altered in any way and proper credit is given: "Courtesy of the Worthington Historical Society, Worthington, OH." Prior written permission of the WHS is required for any other use of Receipt Signed by G.H. Griswold for Taxes Paid for by Orange Johnson for Nathaniel Root's Town Lots. Contact WHS at info@worthingtonhistory.org to request permission. Receipt Signed by G.H. Griswold for Taxes Paid for by Orange Johnson for Nathaniel Root's Town Lots is text, with genre miscellaneous document. Its dimensions are 3.25 in. x 8 in.. It was created on Monday, March 5, 1821. Worthington Historical Society is the Contributor. Orange Johnson, 1790-1876, George Harlow Griswold, 1795-1876 and Nathaniel Root are the Correspondents. 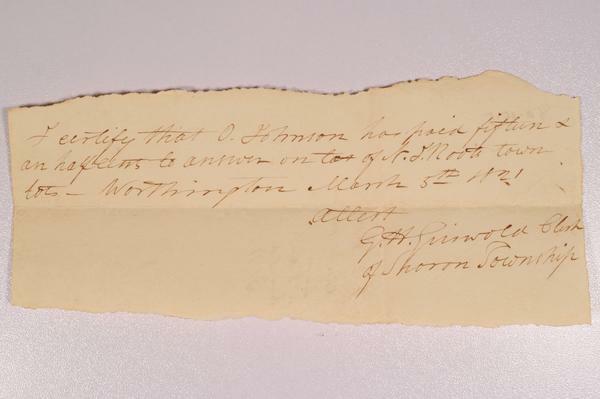 This is a receipt signed by G. H. Griswold on March 5, 1821 for $0.35 in taxes paid by Orange Johnson for town lots owned by Nathaniel Root. G. H. Griswold was a prominent figure in Worthington. In addition to operating a tavern he inherited from his father, Ezra Griswold, he served as clerk, village trustee, recorder, mayor, and postmaster. Nathaniel Root owned a number of land lots in Worthington and surrounding areas. Orange Johnson purchased several of these lots. It covers the topics Orange Johnson House, taxes, historic districts, historic sites, receipts and real estate. It features the people Nathaniel Root, Orange Johnson, 1790-1876 and George Harlow Griswold, 1795-1876. The Worthington Historical Society identification code is 2012.0005.20. The Worthington Memory identification code is whs0987. This metadata record was human prepared by Worthington Libraries on May 16, 2017. It was last updated December 6, 2017.